Today’s cars are extremely voltage sensitive. A vehicle’s charging system must provide the computer with a approx. 12.4 volts regardless of engine speed or load. The computer then modulates this voltage down to a 5 volt reference signal for every switch and sensor in your car. This 5 volt signal is then returned to the computer after having been altered by a temperature or ground signal. The difference in this signal back to the computer is your car’s communication system, and what allows your car to operate. 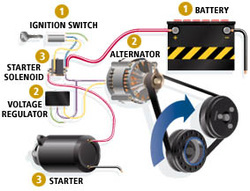 Any variance in input or output voltage caused by a poor battery, malfunctioning alternator, dirty battery, or electrical connections, will cause your car to operate erratically… or not at all. A voltage spike or surge by improper boosting, or a failing charging system, will cause these components to become inoperative. At Good News Auto Repair & Electric Diagnosis we are your one stop repair shop for auto electrical repair in Edmonton. Your vehicles electrical system is fast becoming an extremely complex mix of machinery and computer technology. Many of today's modern cars have left behind the traditional display of information in favor of digital readouts, and including exciting new technology to assist you while you are driving. These advances can lead to one or two blown fuses causing all sorts of unexplained issues. There are a lot of independent auto repair shops that are stuck in the old way of diagnosis which can leave you very frustrated. The best thing you can do is to familiarize yourself with your vehicle electrical system and take a few precautions against any type of automotive electrical failure. The more you know about your own vehicle, the better you will be able to take care of it. At Good News Auto have some very expensive equipment that along with our teams knowledge can save you some money in the long run by doing your Automotive Electrical Repair right the first time. I have taken my truck to Good News Auto for a couple years now. Every time I have gotten excellent service and extremely fair pricing. This last time I had to take my truck in was no different. I had a terrible grinding noise happening and they got me in quickly and found out I needed wheel bearings replaced. The work was done very quickly and again the cost was very very fair! I love the new area they are set up in now with a wonderful large, very comfortable waiting area with access to refreshments. I would and do recommend GOOD NEWS AUTO to anyone and everyone!! Excellent every time!! !